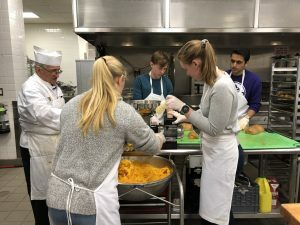 On January 8 and January 10, 2019, the Zilkha Center, in collaboration with Dining Services, hosted an event that allowed students to see behind-the-scenes in Paresky’s kitchens. Each year, the dining staff preserve their fall bounty, which includes locally sourced butternut squash and Rome apples. 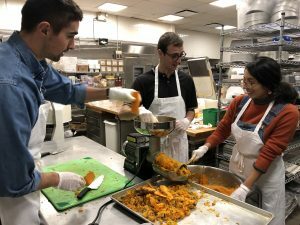 Volunteers were exposed to the cutting, poaching, and grinding processes of making raw apple sauce, as well as the seasoning, roasting, and pureeing process of making butternut squash soup. Students that helped out in the kitchen were also able to talk with dining staff members like Chef Mark Thompson and Chef Fred Ackley on food sustainability on campus. Additionally, this was a time for both parties to converse on food suggestions, spring menu items, Williams’s real food goal, and the dining halls’ plans in contributing to Williams’ goal to reduce its greenhouse gas emissions to 35% below those of 1990 by 2020.